Cristina Reynals specializes in Social Policy Planning and Management, is coordinator for Latin America of the Urban Popular University of the International Alliance of Inhabitants and an adviser to non-government entities defending the Right to Decent Housing. With Fe.De.Vi. 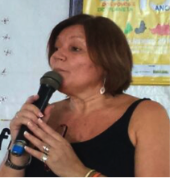 (Federación de Villas y barrios marinades), she has collaborated in implementing many planning projects in her socio-demographic context, producing diagnoses, reporting on social projects, developing possible scenarios, and designing consensus methodologies with her community. In her public function she has coordinated programs for the Legal Establishment of Villages in the City of Buenos Aires, programs of Urban Recovering of the City of Buenos Aires and has been Social Manager at the Housing Institute in the province of Buenos Aires, Argentina. She has been a researcher for more than ten years in “Social exclusion and new afflictions: practices in cross-disciplinary intervention mechanisms” in the Social Sciences department of the University of Buenos Aires, and has been a professor at the same university since 1986.